This continues my 5 part series about my path as an artist. Part 3 is between the years 1979-1989. In 1981, I graduated from college with a Bachelors in Fine Art from Washington State University. There was a professor in college who sat me down and made me decide if I wanted to take the academic Fine Art route or go the way of Commercial Art. Thinking I needed a way to make a living, I chose the Graphic Design curriculum. So I had a lot of different basic art classes in college such as drawing, painting, printmaking, art history, photography and I had an emphasis in graphic design, so I mainly studied design and layout and advertising. I decided I could do my Fine Art on the side. My 20’s were about moving out on my own, starting my career in the graphic arts and having fun. I was a bit of a hippie child, we called it being a granola head. I liked earthy stuff…art, music, being outdoors, hiking, camping, road tripping. I was doing more graphics work in my personal time then fine art projects. I designed my dad’s wine label for his wine making and did the graphics for my mom’s political campaigns. I was working as a graphic production artist to support myself. My first full-time job out of college was as a paste-up artist (production artist) for a weekly newspaper in Seattle. After a couple of years doing that, I freelanced on my own and then wanting to build up my portfolio, I got a job for McCann-Erickson advertising agency as a production artist and soon after moved into the position of Production Art Manager. All along the way, I was doing my fine art and making paintings! I enjoyed being a production artist because I got to use my hands to make stuff. Cutting and pasting and using an exacto blade to paste up ads, brochures, posters, mock-up packaging, you name it! I learned typesetting and the printing industry. I liked that I could leave my job at the office and spend my free time making art if I wanted to. I experimented with different mediums. In 1987-88, I was experimenting with pastels. I remember doing some colorful interior scenes with furniture, sofas and chairs. But I didn’t like them much. My art furniture was painted with acrylic and I collaged pieces of paper with oil pastel colored on it. Then I would coat the entire piece with a varnish which would protect and seal it. I liked the furniture and sold a number of pieces. I made multiple stools and I have one today in my art studio. I painted lots of different items, from mirrors, coat racks, chairs, lamps, to rocking horses but then I was onto something else. It was during this time that I had a fondness for anything with a Southwest flavor. 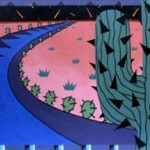 I started painting big acrylic cactus paintings which I did till about 1991. I’ll show you the cactus paintings and my acrylic “What’s it all about” collage painting series in Part 4 of the One Artist’s Journey posts next Thursday. If you’re interested in functional art furniture, I found a few links of some artists doing exactly that. I’m reading your art journey all over again and it is so fun. There are so many similarities between you and I . I absolutely love your designs you made with your cut up pastel drawings. I have to get a new table to put in the old den that is to become my project room. I want a butcher block table. And I can’t wait to burn it with my soldering iron, and stain it with my cutter oil and stab it with pins and spill just a little paint on it. Character is the best patina!! I love all your work. I am enjoying myself so much, reading this journey. I find myself not interested at all in other people’s functional art furniture. I just want your stool. That’s all. The end. Amen. You are so sweet to say that. I do love my stool. I’ve been getting paint on the seat though over the years so it’s starting to age and show signs of wear but that’s okay, gives it some character.